The somewhat-anticipated sequel Pacific Rim Uprising got off to a solid start at the box office during Thursday previews last night, pulling in $2.35 million. These figures come just above the $2.1 million that Warner Bros.' Tomb Raider earned in Thursday sneaks last week, en route to an $8.98 million Friday haul and a $23.6 million opening in second place, just behind Black Panther with $26.6 million. Barring another box office miracle, Pacific Rim Uprising looks to be the movie to finally take down Black Panther, which enters its sixth frame this weekend. Universal rolled out Pacific Rim Uprising in 2,850 theaters last night, before opening in 3,708 theaters today. 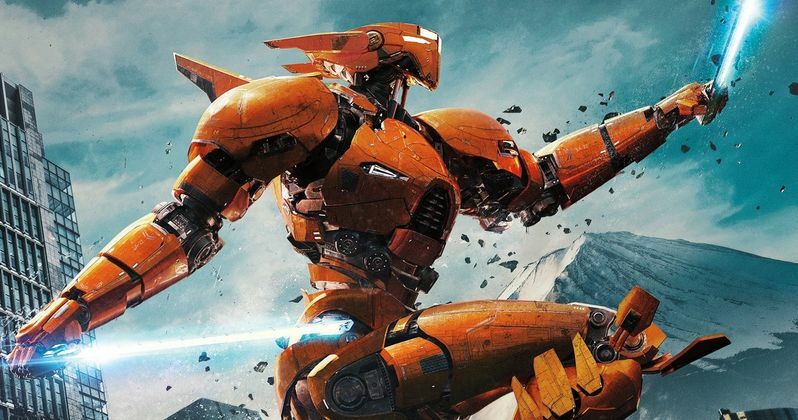 Most analysts are predicting that Pacific Rim Uprising will debut in the low $20 million range, which may not seem like much, but should be just enough to take down Black Panther, which has been predicted to take in anywhere from $16 million to $19 million in its sixth weekend. It had already become the first movie since Avatar in late 2009/early 2010 to win five straight weekends in a row, but for the last time a movie that opened in February to accomplish that feat, you have to go all the way back to 1992 with Paramount's Wayne's World. Pacific Rim Uprising was produced with an estimated production budget between $155 million and $176 million, and if the movie is going to be a hit, it will need a huge showing overseas, just like the original. The original Pacific Rim opened to $37.2 million in North America back in July 2013, but it didn't have too much longevity in the states, finishing with a domestic haul of $101.8 million. That number would only represent a fourth of its global haul, with an additional $309.2 million coming from foreign territories, including the all-important Chinese market, where it earned $111.9 million, the largest haul for any global market, including the U.S. That movie was produced under a whopping $190 million budget. Pacific Rim Uprising is not a Chinese co-production, meaning that Universal and Legendary will only take home between 25-27% of the Chinese box office, whereas it would earn 37% of the Middle Kingdom haul had it been a Chinese co-production. The sequel, which brings back original Pacific Rim stars such as Charlie Day and Rinko Kikuchi, along with franchise newcomers John Boyega and Scott Eastwood, opens day-and-date in China, so it will be interesting to see how Chinese fans respond to this sequel, after making the first Pacific Rim a hit almost single-handedly. Unfortunately, this sequel doesn't exactly have the critics on its side like the first movie. 2013's Pacific Rim, which was directed by fanboy favorite Guillermo del Toro, earned an impressive 71% on Rotten Tomatoes, but this follow-up, directed by Steven S. DeKnight (Marvel's Daredevil) currently only has a 46% score on RT. The movie will also face no shortage of competition, with Paramount's Sherlock Gnomes, a follow-up to 2011's Gnomeo and Juliet, Open Road Films' Midnight Sun, Bleecker Street's Unsane and Sony's Paul, Apostle of Christ. Deadline broke the news on Pacific Rim Uprising's Thursday haul, and you can check back on Sunday for the weekend's full box office estimates.